Home > TechTips > Giving the IRS Your Hard-Earned Money? Giving the IRS Your Hard-Earned Money? April 15th is Tax Day in the United States, and it is only a short week away. Are you sure you are getting all the deductions you deserve? Nobody wants to pay the IRS more than he or she owes. Whether your taxes are completed and filed for this year, you have procrastinated and waited until the last minute or are just filing an extension, maximizing your deductions to lower your overall tax bill is prudent and reasonable. One deduction that’s especially relevant and useful for insurance agents — especially those who work out of the office — is the business mileage deduction of $.54 for every mile you drive for work. The hard part of making sure you qualify for this deduction is to make sure you keep a log for every trip. There are some very specific IRS rules and guidelines you have to follow. Moreover, if you correctly follow the rules, it could mean hundreds if not thousands of dollars in extra deductions on your personal tax return. Fortunately, there are smartphone apps that are designed to help you keep track of each trip and the miles driven. I have downloaded and used several of these apps in the past. The problem is remembering to start the app at the beginning of the trip and stopping it at the end. Then taking the time to make a note about the purpose of each trip. The MileiQ app solves these problems. I have been testing this app for a couple of months and am quite impressed with its capability and ease of use. The big difference with this app is that it automatically detects when you are driving and keeps track of the miles driven for each and every trip. This automatic drive detection makes it easy to capture every mile you drive. No longer do I have to worry about manually logging every trip. The app can automatically detect drives because it runs in the background, continuously detecting your speed and automatically converting each and every trip into miles driven. Even though the app is running in the background, it has been specially engineered to minimize its use of battery power. Battery drain was one of my concerns when I started using the app. However, over the last week the program has accounted for only 6% of my total battery use. This is well within acceptable limits for me; especially given the amount of money it will help me save on my taxes. The MileiQ website has an excellent article that explains the different types of business driving that will qualify for mileage deduction. The app also allows you to give each drive a purpose with a simple swipe. This is important because not every trip is deductible. You can mark each trip as business, personal, medical, charity or any custom category you wish to create. Log any additional details you need for reporting mileage expenses to your employer or deducting mileage on your tax return. Be sure to check with your tax professional. A website dashboard is available to view your drives, make changes to each drive, and customize your experience. It also allows you to keep track of all your drives by creating a monthly and/or annual report — essential documentation for taking deductions on your taxes. Limited Plan: Completely free for up to 40 drives each month. Monthly Plan: $6 per month for an unlimited number of drives. Annual Plan: $60 annual payment for unlimited drives. Click this link to receive a 20% Discount off your annual plan. The more I use this app, the more impressed I am. 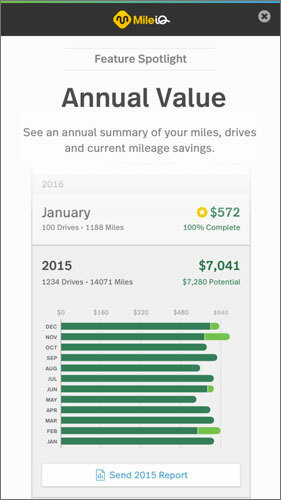 While it will not help me with my 2015 taxes, I certainly will be taking higher mileage deductions on my 2016 taxes. I hope you will too! 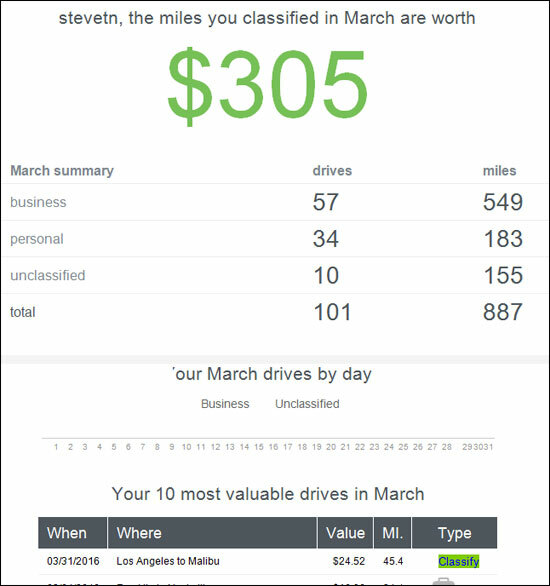 What other ways have you found to track deductible mileage? Let me know in the comment section below. I just started using Sherpashare. It’s designed for rideshare providers, but mileage tracking is included in the “free” version. If I used iOS I’d probably give Stride Drive a try as well. Rob, thanks for the suggestions.